My family live scattered along Ontario’s Golden Horseshoe and while I’ve spent the majority of my life zooming to and fro via the QEW I have to be honest, I simply do not know a lot about Hamilton. I’m a big city boy who lives in downtown Toronto, my parents have a house in Oakville, an aunt recently retired in Niagara-on-the-Lake and my grandparents call St. Catharines home. I’ve zoomed past Hamilton’s iconic Stelco steel mill adorned waterfront since I was a wee one and realized it was high time I hop off the highway and pause to wander through the city’s streets. Toronto is currently undergoing a significant exodus as residents pack themselves out of the city in search of affordable housing. It looks as though Hamilton is experiencing the biggest welcoming boom. After hearing a number of friends and colleagues extol Hamilton’s new fine dinning scene and booming arts community I was curious to experience what all the fuss was about. Growing up as a kid I heard plenty of Hamilton stories from my mother as she grew up on Auchmar Road at the top of Queen Street. My grandfather was the head of Ears Nose and Throat at St. Joseph’s Hospital, a career opportunity that would settle his wife and five kids into a new city perfect for raising a growing family. My mother was born at Hamilton General Hospital, went to elementary school at Chedoke Public, high school at Westmount Secondary and attended Melrose United Church where she later married my father. I spent two days skipping through Hamilton’s colourful streets, picturing my grandparents strolling through the city’s farmers market with five younglings in toe while standing firmly in the present, on a search for The Hammer’s hippest haunts. Located in picturesque Dundas just outside of downtown Hamilton, Osler House offers a luxurious ambiance steeped in history. The house was originally built in 1848 by a lawyer William Miller who lived here for only a couple of years before being appointed as judge for Waterloo County (present day Cambridge). The Osler family moved in shortly after; Rev. Featherstone Osler was the minister of the Anglican churches in Dundas and Ancaster. Several of his sons became well known in Canada, and in the case of Sir William, famous worldwide in his time and still today as the “Father of Modern Medicine.” One brother, Sir Edmund Boyd, was an MP for Toronto and was one of the original founders and benefactors of the Royal Ontario Museum. 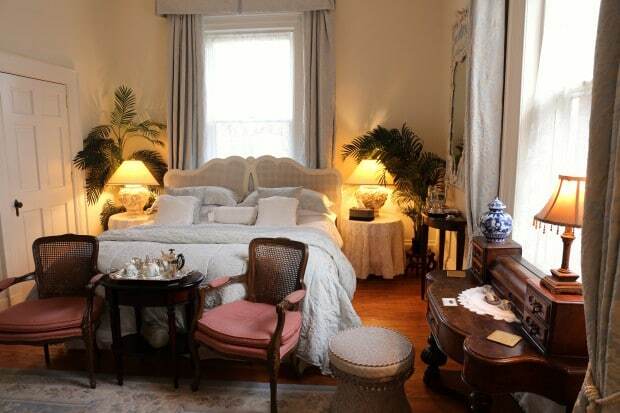 Today Osler House operates as a charming B&B featuring three luxuriously appointed bedrooms, each with a private bathroom (heated floors! ), queen bed, TV and wireless internet. Breakfast is served each morning in an elegant dinning room, or on the sun porch in the summer. It’s popular with romantic couples looking to enjoy a weekend away, visiting professors and professionals in town who teach at nearby McMaster University and has even played home away from home to Her Royal Highness Princess Margriet of the Netherlands who stayed here for four nights in 2012. Founded in 1914, the Art Gallery of Hamilton is the oldest and largest public art gallery in southwestern Ontario. 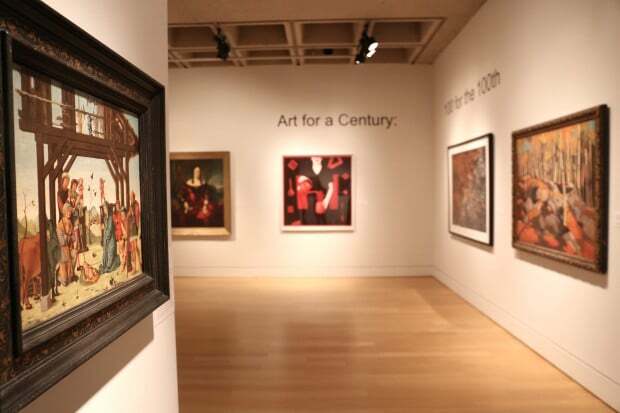 Its permanent collection, which is focussed on historical Canadian, 19th-century European and Contemporary art, now numbers more than 10,000 works and is recognized as one of the finest in Canada. Upon arrival I asked my guide, “do you have any pieces in your collection by my uncle Tom LaPierre?” Was pleasantly surprised to know that three of his drawings and paintings are part of the gallery’s collection. A little piece of my family history seems to live here in The Hammer. Alex Colville’s iconic Horse and Train occupies a unique place in both the Art Gallery of Hamilton’s permanent collection and within the broader Canadian imagination. The moody painting is by far the most asked about work in the gallery’s holdings and is installed semi-permanently in order to allow visitors the opportunity to view it on an ongoing basis. Push through glass doors and you’ll find yourself in a sun-soaked hallway featuring brilliant bronze busts which lead to Kim Adam’s Bruegel-Bosch Bus. The artist explores the patterns of a mobile society, creating works of art that are eccentric hybrids of the readymade. Blending humour, satire and seriousness, he builds “worlds” as a means of social critique. A magnificent visual masterpiece, Bruegel-Bosch Bus consists of a 1960 Volkswagen that appears to pull a post-industrial universe displaying a cornucopia of fantastic and seductive worlds that play with our senses. It was produced over a 7-year span and offers a futuristic diorama as a permanent fixture at the end of the gallery’s Sculpture Atrium. 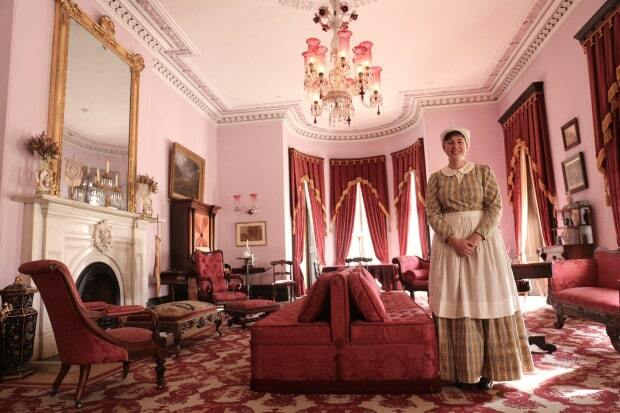 Downton Abbey fans find happiness while strolling through Hamilton’s own Dundurn Castle. The 40-room Italianate-style villa was built in the 1830’s on Burlington Heights; the former site of a fortified military encampment established by the British in 1813. Once home to Sir Allan Napier MacNab, railway magnate, lawyer and Premier of the United Canada (1854-1856) and his family, today Dundurn Castle tells the story of the family who lived above stairs and the servants who worked below to support their affluent lifestyle. Visitors enjoy a guided tour with friendly folks who wear period costumes. Be sure to gawk at the pretty pink Drawing Room, where ladies would meet to gossip after dinner and tip toe into the basement to meet with the castle’s chef who prepares signature shortbread cookies as well as savoury treats using produce grown from a 2-acre heritage garden. When locals buzz enthusiastically about Hamilton they most often direct visitors to James Street North. The neighbourhood was historically a working class area, home to various waves of immigrants including Italian and Portuguese. In recent years, James Street North has become a magnet for artists both local and newly arrived. Visitors from Toronto immediately get a West Queen West/ Parkdale vibe as they skip past cute cafes, fancy fashion boutiques and a swath of inspiring graffiti which splashes across old brick walls. James Street North comes alive on the 2nd Friday of each month as local businesses band together to host an Art Crawl. It’s a perfect time to visit as shops stay open late and lots of artists hold openings in studios to promote their new work. 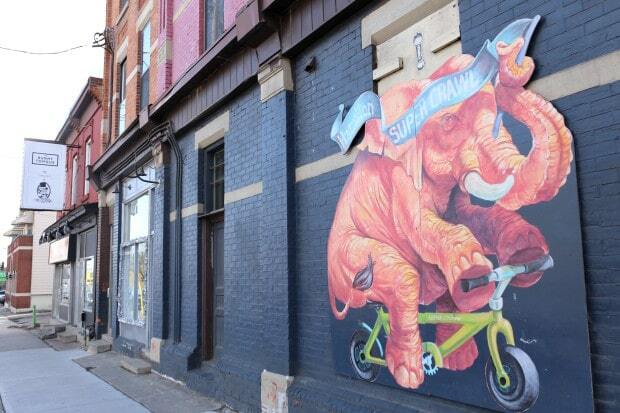 The neighbourhood is also home to the once-a-year Art Crawl offshoot called Supercrawl. The event has grown tremendously over the years and now attracts well over 150,000 visitors who arrive to oogle over streets lined with art installations, music stages and food trucks. Hamilton’s arts and culture scene is indeed alive, evolving and worth exploring! If you’re looking to perk up at a trendy cafe head to St. James Espresso and you’ll find a healthy pride of millennial tech-savvy hipsters working away on their Mac’s. 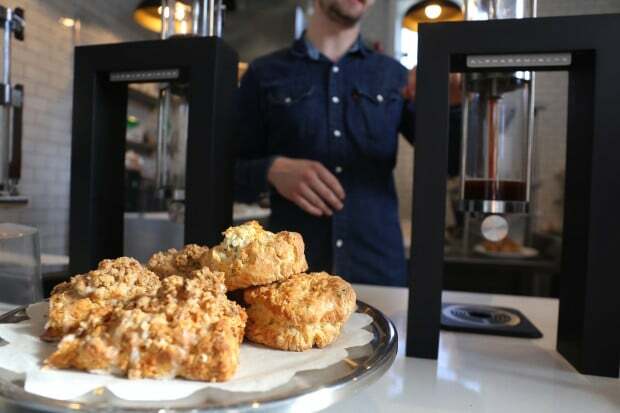 A slew of eye-popping pastries help tend your hungry tummy while a choir of Steam Punk coffee machines use vacuum pressure to gently brew your morning cup. Also located in trendy James Street North, O’s Clothes is a local fashion meets design shop with a great selection for men. Brands off the rack include Cheap Monday, Levi’s, Pendleton, Komono, Yo Sick Zine and Sad Truth Supply. 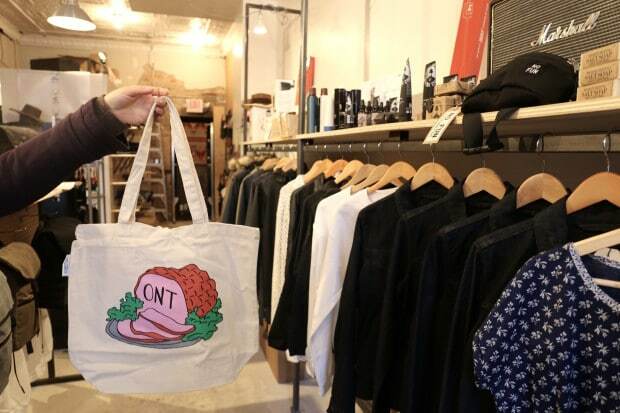 The stores stand out is a hilarious design commissioned by the stores owner that features a sliced roast ham with ONT scrawled across juicy pink flesh. It’s a hat tip to the city’s social promo hashtag #HamOnt. You can buy the lovely lewk on t-shirt or tote bag. The Hamilton Farmer’s Market was originally founded in 1837 at the corner of York and James Street. In August, 1980 the Market moved to its current location next to the Hamilton Public Library. It enjoyed a fresh facelift in 2011, now featuring a community gathering place, space for over 70 vendors to sell their products indoors, fresh meals prepared onsite and the much loved Birks clock which hangs proudly in the centre of the market. I love visiting local markets when I travel as they offer the ultimate community space perfect for people watching. 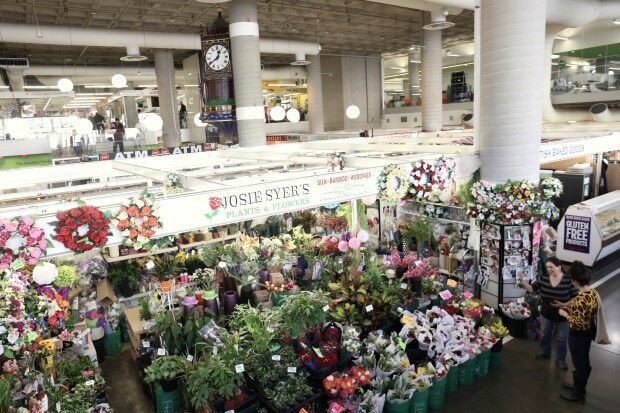 Hamilton’s Farmers Market offers a nice potpourri for the first time visitor where fresh flowers, locally raised meat, pretty produce, chewy cheese and a trendy foodcourt offers everything from Hawaiian pokeh to Japanese ramen. Hamilton is often referred to as the City of Waterfalls as it boasts more than 100 frothing natural fountains along the Bruce Trail and the Niagara Escarpment, which is a UNESCO World Heritage Biosphere Reserve. 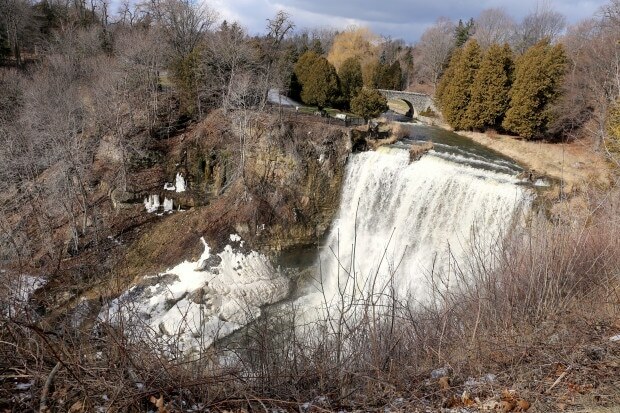 If you’re looking to get some fresh air and exercise but are pressed on time head to Webster’s Falls as you’ll conveniently hit two birds with one stone. Webster’s Falls is a curtain waterfall 22 metres in heigh located at the Spencer Gorge Conservation area. It is one of the two falls within the Spencer Gorge, and with a crest of 24 metres, it is the largest in the region. It is also probably the most popular and widely known in Hamilton. Webster’s Falls also has the highest number of vintage postcards bearing its image, suggesting that it was also the most frequently visited waterfall a century ago as well. Moving along, enjoy a pleasant hike from Webster’s Falls through a forest path which leads to Tews Falls, a ribbon waterfall 41 metres in height which splashes over a magnificent gorge. 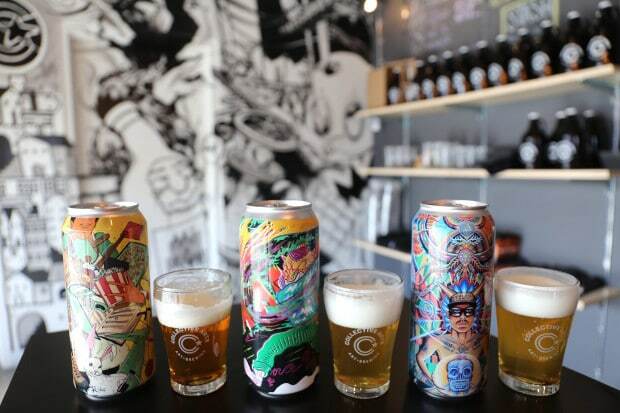 Collective Arts Brewing is a grassroots craft brewer based in Hamilton that aims to fuse the creativity of craft beer with the inspired talents of emerging artists, musicians and filmmakers. Brewmaster Ryan Morrow produces a fine selection of hoppy beers which force IPA lovers to swoon. Each beer is sold in tall cans which are wrapped in limited-edition works of art. Through the augmented reality technology of Blippar app, labels come to life. Simply scan the label to hear the music, see the videos and view artist bios. Now that’s a nifty idea I can raise a pint to! 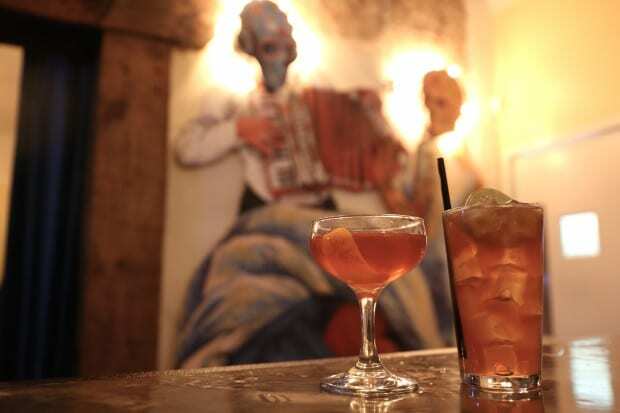 If you’re looking for a late night sip and nibble head to The Mule where “tacos, tequila and bourbon come to party.” Hop up at the Mexicana inspired bar with a friend and enjoy your last few hours sloshing through the bartenders two favourite signature creations: The Evolver (bourbon, amaro montenegro, cointreau) and Drink #2 (tequila, galliano, averna, jalapeno syrup, lemon). Thanks for the excellent ideas! I have just moved to the area and am still learning about all of the places to visit nearby. Thank-you so much for finally giving our city the credit it deserves. I was so tired of people bashing the city I was born and raised in. Truly proud to be a Hamiltonian! I’m putting this on my facebook page for family who come to visit from time to time. However, you left out Ottawa Street North – the fabulous fabric, design, antiques, art place to be, with formidable new restaurants & funky things like costume houses & potteries & candle-makers. You might have to make it “20 top things to do in Hamilton” to incorporate this exciting enclave.